A).The applications in the prescribed format duly completed in all respects, should reach the Director General, Central Council for Research in Homoeopathy, 6l_65, Opposite D-Block, New Delhi-ll-0OSd prescribed closing date. The candidates should also fill up the relevant columns of Admission Ticket (Annex-2) and submit the same along with the application form. The candidates should mention "Application for the post of Research officer (H),, in bold letters on top of the envelope. Educational and other Qualifications: M.D in Homoeopthy from a recognized statutory Board/Council/university included in the Second Schedule to Homoeopathy Central Council Act, 1973. b. Enrolment on the Central Register of CCH or State Register of Homoeopathy. 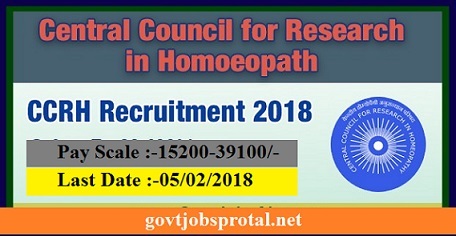 To undertake research in the field of Homoeopathy and assist the Council in the administration, planning and execution of research programmers and other activities of the Council. Last date: The last date for receipt of application is 5th February, 20I8. The competent authority reserves the right to extend the closing date for receipt of applications and also reserves the right to postpone/cancel the recruitment exercise for the post at any stage of recruitment. - Selection will be made through a written test and interview. 1. Multiple Choice Question paper will comprise 150 (one hundred fifty) Multiple Choice Questions (MCes) - 01 mark per question and will be of 02 (t*o; t ou., duration. There wilt be negative marking (025%) for wrong answers. The language of the Questions will be English only. 2.Multiple Choice Questions will comprise questions covering the following subjects: All the subjects under BHMS and common subjects of Vi(H), Methodology, Research updates and Bio-statistics. The questions will be i mixture of both stand-alone questions and based on a given pu.ug.uph (case study)..
3. Interview: This will comprise 30 (thirty) marks. (You will get more information in employment News paper dated on 23/12/.2017 Page no.(19).) Visit the official website for more information.